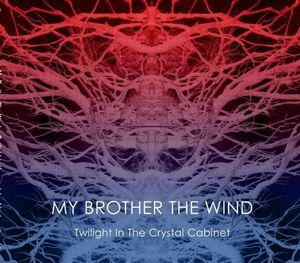 My Brother the Wind - "Twilight in the Crystal Cabinet"
My Brother the Wind is a new band featuring Mattias Danielsen (ex-Gösta Berlings Saga, Makolodama), Nicklas Barker (Anekdoten), and Ronny and Tomas Erikson from Magnolia. This was recorded and mixed in one weekend in June 2009 and it features 6 long tracks of very cool improvised rock music. The CD starts off with the 14 minute Karma Grinder and is quite dreamy. By 3½ minutes the track is building with some really fantastic guitar in the left channel and the dreamy stuff in the right. By 7 minutes we have quite a cool jam going on and Ronny is just laying down the killer bass throughout. At 11 minutes the track is now entering into good old psychedelia. Cool opening track. Electric Universe kicks things up a notch in pace though as the band really fly and the guitars get more psychedelic and phased out towards the end. The title track is next and is a short 4 minute track with some beautiful and dreamy guitar. Precious Sanity is a 1½ minute bounce back and forth between all the musicians that may sound jazzy to some ears. The Mournful Howl of Dawn though kicks in and takes us on another trip for 13 minutes and features some very nice back and forth melodic guitar parts. The CD ends with Death and Beyond, the longest track at nearly 17 minutes. It is a very melodic track but it also features some of the best guitar soloing of the whole record. I think this is a fantastic CD and due to its all analog production, really deserves to be out on vinyl. Enjoy this all improvised and instrumental music by great musicians.